On June 30, 1965 the NFL granted a franchise to Atlanta, moving into the Deep South for the first time and outmaneuvering the rival American Football League to do so. Originally, it had appeared that the AFL would be putting a club in Atlanta, and Commissioner Joe Foss had stated as much. The President of Cox Broadcasting Company, Leonard Reinsch, was to be the owner (he had also looked into the possibility of moving the Denver Broncos to Georgia). However, NFL Commissioner Pete Rozelle acted quickly to line up an ownership group headed by insurance executive Rankin Smith that paid $8.5 million for the franchise. The new Atlanta Stadium was secured for Smith’s group, and the chastened younger league was forced to look elsewhere (settling on Miami). It was a major coup for the city that had also lured major league baseball’s Braves from Milwaukee and generated much initial fan excitement. A radio station contest came up with the name Falcons for the new team and 45,000 season tickets were sold within a few weeks of becoming available. Former player and scout Gene Cronin was chosen as director of player personnel while Norb Hecker, defensive backfield coach under Vince Lombardi in Green Bay, became the first head coach. A draft of veterans from the other NFL clubs brought mostly marginal talent, since each team was able to protect its best players. The draft of college players was more promising as the Falcons were able to pick at the top and bottom of the first five rounds, as well as the top of the remaining rounds, giving them 25 choices in all. With the first overall choice, they took LB Tommy Nobis (pictured at top), the Outland Trophy winner out of Texas. 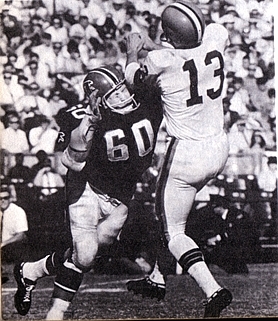 The Falcons were placed in the Eastern Conference for the ’66 season, but because the league now had an uneven number of teams with 15, they played each of the other NFL teams one time apiece (a so-called swing schedule, as opposed to the usual arrangement of playing a home-and-away series with each conference opponent). It had been anticipated that Dennis Claridge, who had thrown a total of one pro pass as backup to Bart Starr and Zeke Bratkowski in Green Bay, would be Atlanta’s first starting quarterback. However, rookie Randy Johnson (pictured at right), their second pick at the end of the first round out of Texas A&I, gained the job instead and performed reasonably well while completing 43.7 % of his passes for 1795 yards with 12 touchdowns and 21 interceptions. Another ex-Packer, HB Junior Coffey, was the club’s rushing star with 722 yards on 199 carries (3.6 avg.) and four TDs. He teamed with FB Ernie Wheelwright, formerly of the Giants, who added 458 yards on the ground, but neither had breakaway speed and depth behind them was lacking. 29-year-old flanker Alex Hawkins, a long-time reserve and special teams standout with the Colts, was Atlanta’s leading receiver with 44 catches for 661 yards (15.0 avg.) and two scores. TE Billy Martin, who split time with ex-Card Taz Anderson, pulled in 29 passes, one more than starting split end Vern Burke. Center Frank Marchlewski showed promise and starting guards Dan Grimm and Ed Cook and tackles Don Talbert and Errol Linden did reasonably well, although once again, depth was an issue. On defense, Nobis stepped into the lineup at middle linebacker and had an immediate impact, gaining Rookie of the Year honors and selection to the Pro Bowl. But while OLB Marion Rushing was effective on the strong side, the weak side linebacking – held down by over-the-hill veterans Bill Jobko and Larry Morris – was lacking. The line was undistinguished and contained the team’s oldest player, 35-year-old DE Sam Williams. Starting cornerbacks were Lee Calland and Ron Smith, better known for his kick returning. 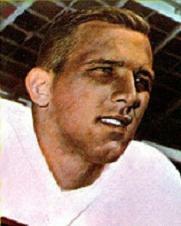 FS Bob Riggle did well in tandem with SS Jerry Richardson, who led the club with five interceptions. Lou Kirouac handled the bulk of the placekicking and was successful on just half of his field goal attempts (9 of 18) and missed five of 24 extra point tries. Punter Billy Lothridge was better, averaging 40.7 yards on his 73 kicks. The Falcons lost their first nine games but won three of their last five to finish on a reasonably high note – and ahead of the 1-12-1 Giants (the team they defeated for their first regular season win). Not surprisingly, the team ranked at the bottom of the league in total offense (3536 yards) and scoring (204 points) while giving up the most points (437). Still, fan support was enthusiastic, and there were hopes for improvement in ’67 based on the club’s improved play in the late season. Instead, the club regressed and won just one game. Coach Hecker failed to survive a third year at the helm in 1968, giving way to Norm Van Brocklin, previously the head coach in Minnesota following his Hall of Fame career as a quarterback. The Dutchman guided the Falcons to their first winning record in 1971, but they would not appear in the postseason for the first time until 1978.